Well, that wasn’t the message the Wizards were trying to send. LeBron James scores 33 points to go along with 14 assists and nine rebounds as the Cavaliers erased a 17-point fourth quarter deficit and beat the Wizards, 119-115. #WizardsKiller Jeff Green scored 21 points and Kevin Love was on fire with all 16 of his points in the first half for the Cavaliers team as they win the season series against the Wizards 3-1. After a slow start to this one and a 13-point deficit after one quarter, Washington got into a rhythm in the second period and was able to claw their way back in this one starting on the defensive end. Washington was turning Cleveland over and made them pay for their mistakes on the other end as the Wizards shot 63 percent in the quarter and cut the deficit to five, 59-54 at the break. The good Wizards, the ‘everybody eats’ Wizards were on display until the midway point of the fourth quarter as they were able to build the lead out to 17, 104-87 in what looked like an inevitable victory. But defensive lapses, hero ball, and LeBron being LeBron would flip that narrative as the Cavs complete the comeback and beat Washington, 119-115. We got the good, the bad, and the ugly from John Wall this evening. Let’s start with the good. Wall scored a team-high 28 points on 10-20 shooting to go along with 14 assists and three steals in just his third game back from injury. Wall looked like the Wallstar of old as he was pushing the ball early on in this one and wasn’t settling for jumpers and attacking the hole. Not only that, he dished out six assists to go along with his 10 points (all from close in) all in the first quarter. He looked to run in transition and it didn’t look like his knee was bothering him tonight as he found Beal on the wing for a transition three on multiple occasions. But with the Wizards up 17 in the fourth quarter, that’s when the bad habits started to rear their ugly heads – as in hero ball and turnovers. 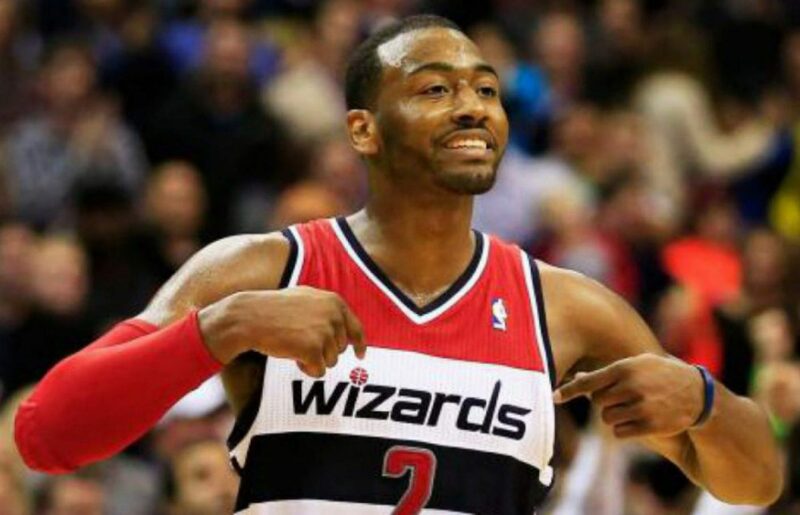 Wall and the Wizards reverted back to their hero ball ways late in the fourth quarter. The ball would stop moving and Wall would pound the ball into the floor only to force up a fadeaway jumper as the shot clock wound down. And the turnovers. Wall, who was careful with the ball for most of the evening, had two very costly turnovers late in the game. He got his pass picked off by LeBron leading to an easy transition opportunity as the Cavs were mounting their comeback. And with the Wizards down just two with seconds to play, rather than attacking the hole, Wall pulled back and tried to find Morris at the top of the key for three only to get his pass picked off. Wall was 10-20 from the field tonight and just looking at his shot chart, you can tell pretty easily as to which shots came at what point in the game. As Washington started playing hero-ball, Otto Porter went missing. Porter scored 18 tonight on 8-13 shooting to go along with eight rebounds. He scored 12 points in the first half, mainly of midrange jumpers. In the third quarter, Porter got going by creating his own opportunities by either slashing to the cup or crashing the offensive glass for a tip in. But then, Porter went missing. As the ball stopped moving, Porter stopped getting opportunities evidenced as he didn’t score in the fourth quarter. Say what you want about Porter’s ability to create, however, Washington still needs to run sets for him to keep him involved in the offense. Up Next: Washington heads home to take on the sub .500 Hawks as the regular season can’t end soon enough for this team. Wizards at Cavs Final: Wiz too much for the Cavs in 127-115 win. Seven Wizards players scored in double-figures — led by John Wall with 37 points andBradley Beal with 27 — as Washington defeated Cleveland, 127-115. Kelly Oubre also chipped in 16 points on 7-8 shooting as the Wizards picked up one of their best road wins of the season to kick off a brutal five-game road swing. Washington started the game by turning in one of their best quarters of the season, thanks to the hot shooting of John Wall and Bradley Beal. Wall came out looking for his jumper early on and he was knocking them down. Once Wall was in a rhythm, his backcourt mate, Bradley Beal decided that it was his turn to get going. Beal connected on two very tough step-back jumpers as the Wizards started 13-17 from the field. But John Wall wasn’t done there. Wall stayed in attack mode and finished the quarter a perfect 8-8 from the field with 18 points and five assists as the House of Guards combined for more points (27) than the Cavaliers scored in the quarter (26) as the Wizards took a 40-26 lead at the end of the first quarter. The hot shooting carried over to the second quarter as the Wizards were able to stretch the lead out to 17. But as expected, the reigning champs would counter. The Wizards had a few lapses on the defensive end leading to two open threes for Kyle Korver in the corner. Then, LeBron started doing LeBron things, driving to the hole for poster dunks and finding his teammates for open shots as the Cavs were able to cut the lead down to six midway through the quarter. Washington responded with a run of their own as the starting unit came back in to finish the half. The Wizards shot 70 percent in the first half and 5-9 from three-point range as they led 71-61 going into the break. Again, the champs wouldn’t go down easily. With James on the bench, the Cavs’ reserves made a run to cut the Wizards lead down to 5 heading into the fourth quarter. The teams traded baskets to start the fourth quarter but the Wizards would clamp down on the defensive end. Kelly Oubre led the charge, turning Cleveland turnovers into points on the other end. His signature play came midway through the fourth quarter as he gathered a Markieff Morris miss for a putback layup to put the Wizards up 10, 117-107. The Cavs would waive the white flag at the two-minute mark and empty their bench as the Wizards pulled away for an impressive, 127-115 win. We’ve seen some incredible performances from Wall over the years and the first quarter of tonight’s game was right up there. Wall was a perfect 8-8 from the field including 2-2 from three-point range as he scored 18 points and dished out 5 assists in the first quarter. Wall did most of his damage from deep and in the midrange during the first quarter and then attacked the hole later in the game. Wall either scored or assisted on 28 of the Wizards’ 40 first quarter points. Defense hasn’t been the issue for Oubre, his struggles have been on the offensive end. Oubre scored 16 points off the bench, the most he’s scored in months, with most of them coming either on transition layups or putbacks for second chance points. Oubre was a huge spark off the Wizards bench and they needed it considering Bojan Bogdanovic missed the game with back stiffness. Washington’s defense through the first three quarters was not very good. However, the Wizards stepped up defensively in the fourth quarter when it mattered most. Wall played with intensity, they locked down LeBron James (as much as you can), and turned the Cavs over to seal the victory. The Wizards’ best fourth quarter defense came with the small lineup of Wall-Beal-Porter-Oubre-Morris on the floor.